The Chanting Tour was very uplifting and joyful. I particularly appreciated the new breathing and posture exercises, which I practice daily. These exercises have improved my health and well-being, as well as improving the quality of my meditation and chanting practices. Thank you, Gurumayi, for making this available at home, on my computer. I am very grateful for the opportunity to have satsang with devotees from around the globe through the Siddha Yoga path website. I was particularly touched by the share from a devotee from New York about Baba’s quote on the Practice of Chanting. This devotee said that the vibration of chanting could massage away "... any contractions arising from perceived differences, judgments and limiting beliefs..." opening the doors of the heart. I recently faced a challenging situation regarding a communication misunderstanding in my job. So, after reading this share, I decided that instead of wasting energy in proving that I was right and deepening the differences that divided us, I would try reverse the contraction by chanting. I chanted wholeheartedly, and rose above judgment and limiting belief. It was as if God answered with his own love song. Then, I was able to perceive perfection, benevolence, and beauty in the situation and it resolved. Thank you, Baba and Gurumayi, for your Teachings on Chanting. Baba's words remind me of the times I have spontaneously started to chant and immediately transcended into a place of presence, of peace, and of gratitude. On leaving work at the end of the day, I often experience the cells of my being singing Om Namah Shivaya in exultation and thanks for the day’s work done. While I am walking down the street with my granddaughter or on my way to catch a bus or tram, a chant comes forth—an expression from the heart that arises without coaxing and nourishes, sustains, and refreshes me. Baba’s words lead me to reflect on all the times when I wanted to clear and calm my mind, and I turned to the recordings of Gurumayi and Baba chanting to help me do so. I think of times when the pressures of work have seemed on the verge of overwhelming me, or when I've been driving in heavy, slow-moving traffic just when I need to get somewhere on time, or when I’ve received saddening or challenging news. The effect of chanting along with Gurumayi and Baba has been a constant and miraculous phenomenon in my life—centering me, putting me in touch with the presence of God in my own being, allowing me to breathe freely and give my best. 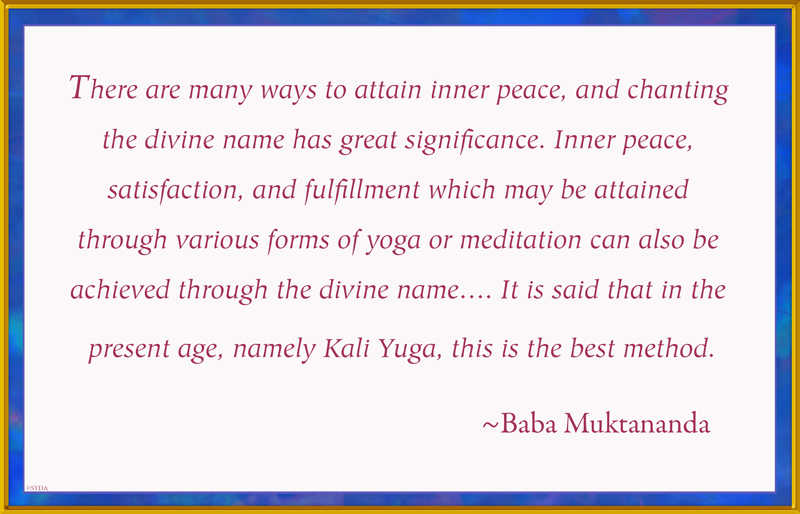 As I read Baba's teaching on the power of chanting God's name to attain inner peace, I asked myself, "How do I experience this?" I realized that when I chant to God from deep within my heart, I feel that God answers back with his own love song—echoing the powerful vibrations of the chant, massaging away any contractions arising from perceived differences, judgments, and limiting beliefs. Chanting opens the doors of my heart, revealing the mystical kingdom within, and the bliss and peace of the Self. I love how Gurumayi relates chanting to movement—like when she describes the Name as a force which "actually moves through your whole being." Her words remind me of when I was a young girl, and I'd spin around and around as my parents chanted at home. It didn't matter that I'd sometimes get dizzy and fall over. I felt free, I felt pure, I felt sacred. I'd stand back up and spin some more. Even now, years later, I feel motion in chanting. Sometimes I sway in my seat. Sometimes I tap out a rhythm with my fingers. And sometimes, when I'm walking home from satsang, the chant still sounding in my head, I find myself spinning—ecstatically. I experienced the truth of Gurumayi's teaching in the very first years of my sadhana, three decades ago. Even though I was still very new to the Siddha Yoga path, I knew that there was an inexplicable power in chanting the Name. I could feel it best when the chant had ended, and we sat for a while to meditate. It always felt as if all the molecules in my body, which had been set in motion by the vibrations of the chant, had come to rest in an exquisite stillness — and had settled down into a new, far more harmonious arrangement than they had ever known before. Thank you, Gurumayi, for renewing my understanding of this divine power. When I chant the Name, it is a force that enlivens and flows through my being, bestowing grace throughout my body, mind, and spirit. I notice it most as a subtle energy. I cannot explain this to my friends and family, but I like to think that the love and bliss I experience is radiating out to them from deep in my soul. 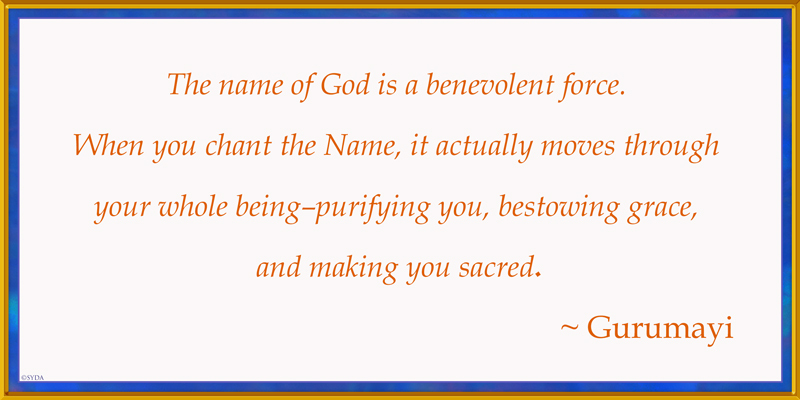 I have a new experience each time I read Gurumayi's words on the power of singing God's name. This morning, the words, "Many cultures have been kept alive by the power of singing," seemed to jump off my computer screen. It was as if I were seeing these words for the first time! These are encouraging words in challenging times. They will inspire me to raise my voice in song at every opportunity! This morning, Gurumayi’s words, “Singing in praise of God is an intrinsic part of every being,” inspired me to give attention to the bright sounds of the birds at the feeders outside my window. I thought of the songs of the whales and other creatures of the sea, the roar of the lion, the calls of the wolves, the trumpeting of elephants, and the humming of the bees, the crickets singing with their legs—and all those sounds our ears cannot hear but which, nonetheless, may be helping to sing the beauty of the earth into manifestation. I’m thinking that perhaps the main reason we, as human beings, have voices, is so that we can join our voices to all the others and sing in praise of God. Last night before retiring to bed, I read Gurumayi's teaching and felt her words were like the lyrics of a beautiful song. During the night, I dreamt there was a very happy young baby, singing joyfully. And everyone who witnessed this was filled with joy and sang along. Pondering my dream, I then remembered singing to my children from the time they were born. This seemed such a natural thing to do. I would lull them to sleep with songs from my heart. As they peacefully rested in my arms, I imagined they could feel the vibrations of love emanating from my body. As they grew older, I taught them to sing, and we sang together in great delight. I think God gave us the ability to sing so we can feel in our physical being his presence within, and join with others in the oneness of peace, joy, and love. Singing magically dissolves the walls of separation between people. Just this evening, I asked myself, “Am I singing for the sky, the wind—for whom or for what—especially if God is in everything?” And then the answer came. I am singing for myself, for my own heart and joy and the love that springs forth from chanting. 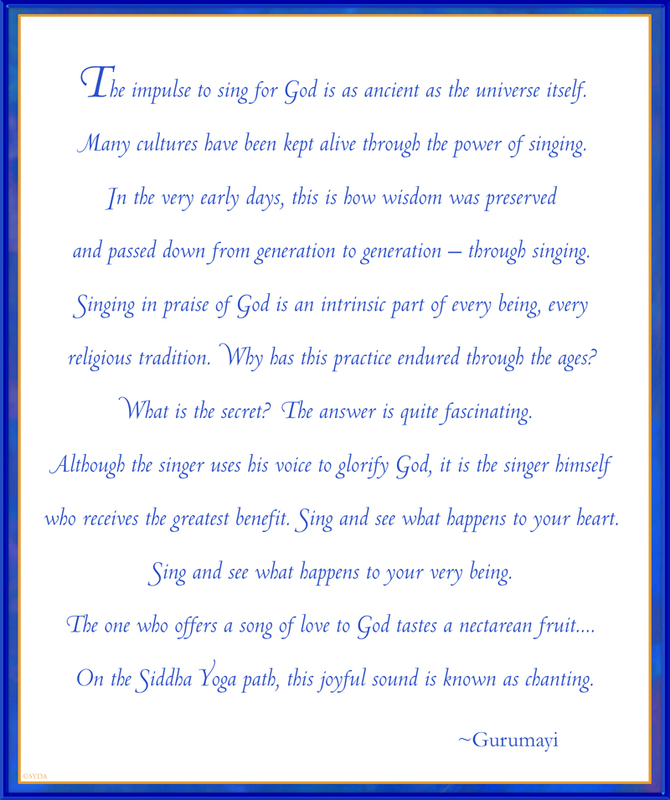 Gurumayi's words about the practice of singing for God shed light on my own experience of chanting since the launching of the Chanting Tour. I have begun to understand that the power of chanting is eternal, and it is revealed to me by my own practice of chanting. Thank you for this profound new understanding, Gurumayi. I'm so happy to read Gurumayi's teaching on the blessings of singing in praise of God. I am studying Sri Bhagavad Gita and I decided to recite some of the verses to get the feeling of the meter with the hopes that the scripture would come to life for me. It most certainly did! I experienced the deep devotion and love between Lord Krishna and Arjuna. I also understood that this love was within my own heart, and everyone's heart, and that my own highest Self was singing to me and everyone.